Summer Salute 2018 will take place on Saturday, May 26, at beautiful Rancho San Rafael Park in Reno, Nevada. Online registration is now open. Thank you for your interest in Summer Salute. 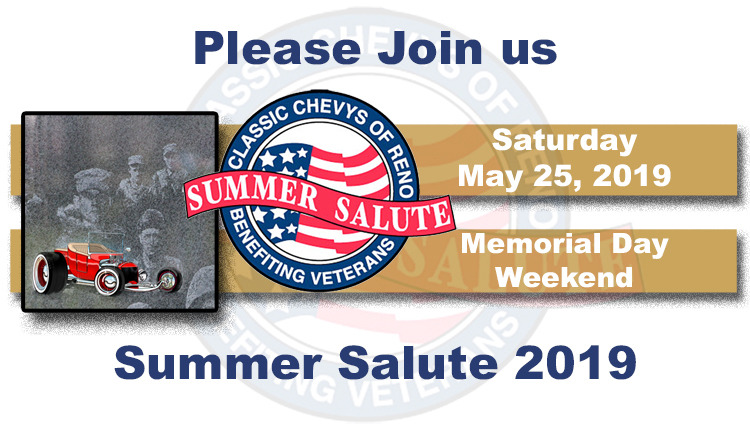 Classic Chevys of Reno teamed up with The Veterans Guest House, Honor Flight Nevada, along with KKOH AM 780, to create a charity-focused Memorial Day weekend event called Summer Salute to benefit our Veterans. The first annual Summer Salute event held on the grass at Rancho San Rafael Park in 2013 was a tremendous success. With more than 500 cars entered in the show and over 1000 participants and spectators in 2014, Summer Salute is now the largest car show in Northern Nevada, next to Hot August Nights. Join us as we celebrate our 6th Annual Summer Salute Car Show as we anticipate nearly 700 entries! ALL NET PROCEEDS SUPPORT OUR LOCAL VETERAN ORGANIZATIONS.